Pegasus Lectures offers Online Physics Office Hours. As ongoing support for our customers, Pegasus Lectures offers Online Physics Office Hours. Students and exam candidates can have not only their own physics questions answered, but they can also watch and listen as other participant's questions are asked, discussed and answered. If participants are uncomfortable offering questions during the session, they can either submit questions prior to the online session or submit written questions anonymously during the session. What is the cost to participate in the online Physics Office Hours sessions? Registrants in any of the Pegasus Lectures live or online physics seminars, program directors, instructors and students are invited to participate at no charge. These study sessions are designed to maximize the effectiveness of our physics seminar attendee's pre and post-class study sessions, and are an integral part of our continuing support to our customers. Don't have a specific question? Simply indicate that you don't have a specific question but would like to participate in the Office Hours. Participants often find that by watching and listening to the unfolding discussion, they are exposed to questions and subtle points that may not have occurred to them previously. To listen and participate, a microphone and speakers (VoIP) is required (a headset is best). If you do not have both speakers and a microphone on your computer, you may call in using your telephone. High speed internet is required to be able to view the interactive discussions. How do I connect to the meeting? Participants can connect to the online Office Hours by clicking on the link that is provided in your email invite. 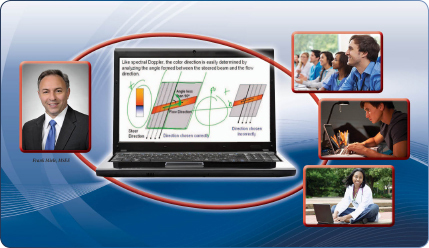 If you are enrolled in one of our physics classes or are a student in a program using Ultrasound Physics &Instrumentation, 4e as your primary text and DID NOT receive an email invite, register below. Tuesday, April 23, 2019 6:00 - 7:00 PM CST.